"Following the break-up of the Soviet Union in the early 1990s, Finland experienced a severe recession, not dissimilar to current difficulties in Ireland. "Unemployment climbed from 3 per cent to 18 per cent in two years. GDP dropped 13 per cent at the same time and Finnish public spending reached close to 70 per cent of the overall state budget. 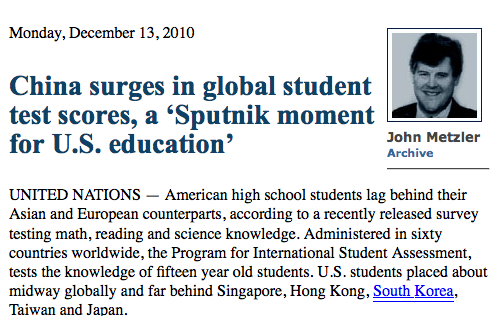 "The Finnish Government of the day bravely decided that increased investment in education was the roadmap to recovery." So wrote Dr. Pasi Sahlberg in Tuesday's Irish Times, encouraging Ireland to follow Finland's path to economic recovery. At the same time they chose to ignore the other nation which lay atop those comparatives, Finland. This mirrors America's response to that 'first Sputnik moment' - when American leaders also chose to celebrate a miserable, dictatorial nation as a "model" for our youth. 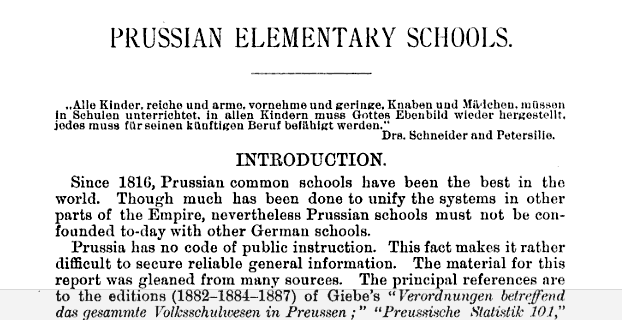 finding a superior education system - the original "Sputnik Moment"
Or really, the "truly original" "Sputnik moment" came a century earlier when young America was completely enamored of the Prussian Empire, and chose to import that nation's system of filtering out students - the age-based grades we still live with. 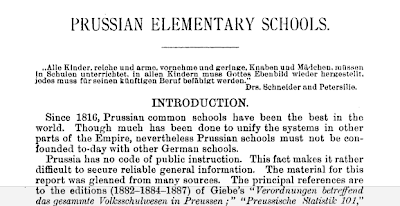 "Prussian common schools have been the best in the world..."
Why the love of the dictatorial? 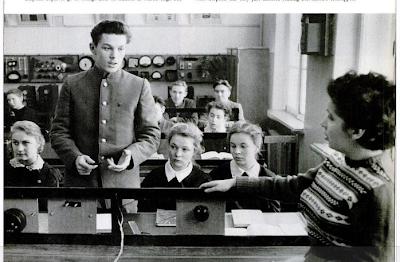 Why the love of the education systems of societies which none of us would choose to live in? And why might Finland's results be seen as unimportant due to a lack of diversity much less significant than the lack of diversity in Shanghai's "high-performing" schools? Is it just that Finland outspends us on education? That Finland believes - unlike Arne Duncan - in highly trained teachers? That Finland pays unionized teachers extremely well? Part of that "is it" - Finland's success runs counter to all that our "political class" wants Americans to believe about schools. If we "believe" in what Finland is doing, than Duncan, Gates, Obama, Rhee, Bloomberg, Oprah are all wrong, The New York Times and Washington Post are wrong, and these "leaders" of politics and opinion are not likely to admit that. But it goes further and deeper. Finland, an egalitarian, democratic, and socialist nation can not be allowed to be a model, in our leaders' eyes. That would suggest that much about America is wrong in ways which would threaten everything from Bill Gates' fortune to the place of privilege in the future held by Barack Obama's daughters. If Finland is allowed to be a model it might mean that the US would need to accept social mobility, and the children and grandchildren of New York Times editorial and corporate employees would no longer be guaranteed admission to elite schools. If Finland is a model, there's a chance for all to succeed, which means that both the achievement gap and the income gap might close. So American "leaders" look to China now* as they did to the Soviet Union in 1958 and the Prussian Empire in 1858 because they want education to fail most children, because they want society to remain as it is. If they wanted things to change they'd be talking about Finland night and day. "Interestingly, Finland has not employed any of the market-based educational reform ideas in the ways that they have been accepted within education policies of many other nations, United States and England among them. "By contrast, a typical feature of teaching and learning in Finland is high confidence in teachers and principals as respected professionals. "Another feature involves encouraging teachers and students to try new ideas and approaches rather than teaching them to master fixed attainment targets. This makes the school a creative and inspiring place for students and teachers. "What is important is that today’s Finnish education policies are a result of three decades of systematic, mostly intentional development that has created a culture of diversity, trust, and respect within Finnish society in general, and within its education system in particular. The result is a cocktail of good ideas from other countries and smart practices from the tradition of teaching and learning in Finland. "The Finnish way has transformed an education system deemed as mediocre by international standards in the 1980s to a celebrated model two decades later." * I think the only thing that the US Republican Party and the Chinese Communist Party disagree on is abortion. On all other issues, from the environment to workers' rights, from free speech v. state security to the role of business leaders, John Boehner and Hu Jintao are in perfect sync. Sorry, but Finland is not socialist nation! By any definition of "democratic socialism," Finland is socialist, as is all Europe - though - obviously, the UK a bit less so. It may not "feel" socialist in the European context, but in the global context it is on the very far left of national economics.